In July 2016, Town and Country magazine published an article called “Why Pink and Green is the Best Color Combination Ever.” One look at the design for the 1989 single released by North Carolina rock band Dish, and it’s clear that graphic designer Maura Dillon was thinking the same thing nearly 30 years before. The right side of the cover is pink, but Dillon uses shades of green and bright pink to outline and suggest the details of the woman holding a serving dish. The left side of the cover is a granny-smith green with superimposed white and pink text. The effect is striking, in part because pink and green are nearly opposite each other on the color spectrum. Dillon worked the concept of opposites into other aspects of her design as well. The woman shown on the front cover is serving food while the man on the back is wearing a chef’s hat, indicating that it was he who made it. In addition, the center line that divides the green from the pink on the front cover is echoed by a change in font and color. The first part of the band’s name is written in white while the second half is pink with a green border. Dillon’s decision to create a two-tone album cover may well have to do with the fact that the record contains only two songs. 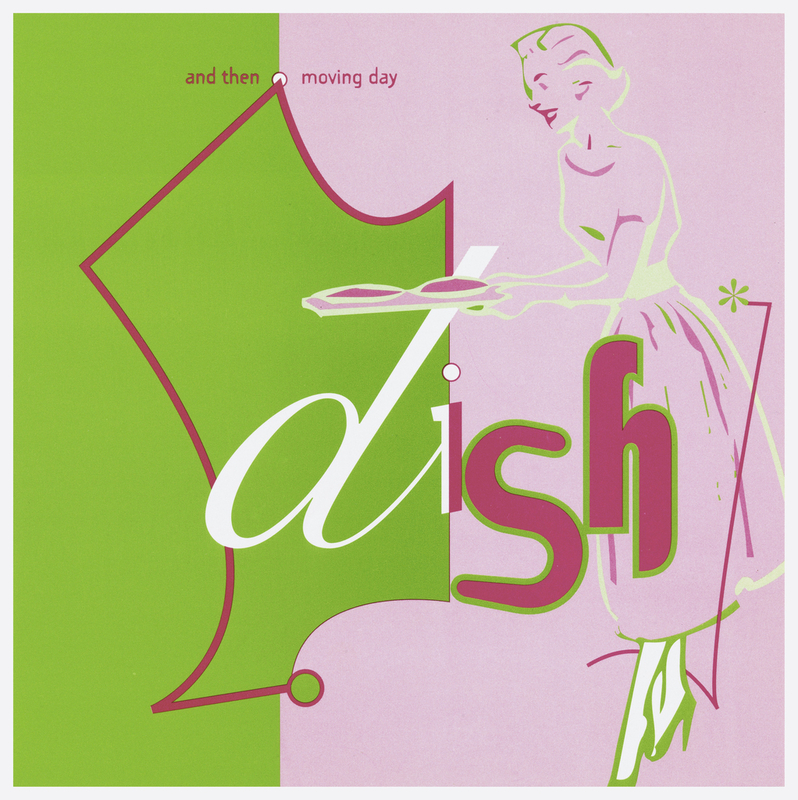 She reinforces the album’s duality by printing the song “And Then” from Side A on the left side over the green background while the song “Moving Day” from Side B is on the right on the pink background. Maura Dillon graduated with an MFA from California Institute of the Arts and went on to teach graphic design at the University of North Carolina. Her decision to invoke design that brings to mind 1950s female domesticity is tongue-in-cheek, as Dish was a female-fronted rock band connected to the punk scene of Raleigh, North Carolina in the late 1980s. The woman on the cover, who is both serving a dish, and perhaps also embodies the colloquial meaning of the term, is a playful counterpoint to the style of the band for whom Dillon designing: Dish. This post was written by Jeremy Witten, former Cooper Hewitt curatorial intern in Drawings, Prints and Graphic Design. He is currently studying music at the University of Alberta in Canada.